The largest event in our calendar, ThinkCon brings together some of the best communicators in their field. Speakers are handpicked not just for their knowledge of their subject but also their ability to entertain and inspire. The event takes place over the course of a day, where we invite you to join for one, some or all of the talks. Previous speakers have included The Naked Scientists, Richard Wiseman (author of several popular psychology books and researcher into the world's funniest joke), and Helen Keen (creator of "It's Rocket Science", her show at the Edinburgh Fringe Festival and hit Radio 4 series). We're busy organising next year's event, but if you're already excited (and let's face it, why shouldn't you be) then check out the ThinkPodcasts and follow us on Twitter, like us on Facebook, or just sign up to our traditional mailing list. Sign-up to our mailing list using the box below. As part of the ThinkPodcast, you can find many recordings of previous talks and interviews with the speakers. We would like to graciously thank The Wellcome Trust for in part funding this project. 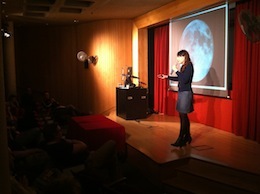 ThinkCon takes place during, and receives 'in kind' support from the University of Cambridge's Science Festival. The Science Festival is the largest free festival of its type in the UK and in 2011 received over 35,000 visitors to nearly 180 events. The fesitval is organised by the Public Engagement Team at the University of Cambridge.